When working with woolens in general, there comes a point when you are going to have to consider comfort. This is one of the first things that I consider now before I start a project with wool. For me, I've found that wools can be scratchy next to my skin. Even if its a very fine quality cashmere, they do end up being a bit on the itchy side. It's worse in some woolens than in others and that's fine, but it's also good to take into consideration how to make wool garments comfortable, if needed. Today I thought I would share just that and hopefully you'll find working with wool more appealing if you were worried about the scratchy factor! First things first. 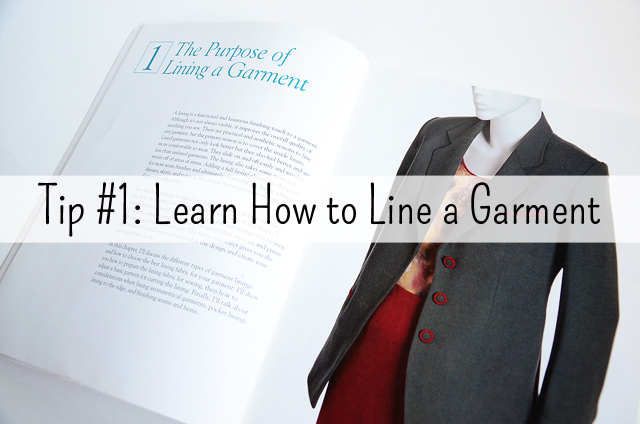 At some point you'll need to start thinking and learning how to line a garment. It's a good skill set to have. I love lined garments. I always have. I think lining a garment adds longevity to just about anything. It also creates a touch of professionalism and takes your sewn projects to a completely new level. One book all sewing enthusiasts should own is Easy Guide to Sewing Linings, by Connie Long. It is essential. I've talked about it here before and it is my most recommended book to anyone who wants to learn the art of sewing with linings. If you want to branch out to use wool more often, get this book (note: this book is out of print, but Taunton has created an e-book). You'll be glad you did. Another tip to consider whenever you are about to embark on a wool project is points on your body where wool is bound to touch and whether or not one area of the body is more sensitive to the itch factor than another. When I'm making coats and jackets, I consider the collar as an area of comfort I want to address. This is something that Beth from Sunnygal Studio tipped me off to some time ago and now it's something I always consider as my neck is prone to itching more than other parts of my body. Mixing fabrics is bound to add interest and so now I think about an alternative for a collar piece. Like cotton or silk. Did that in my J. Peterman coat which added real comfort (used a cotton velveteen). Something that goes along with this idea is waistband techniques. 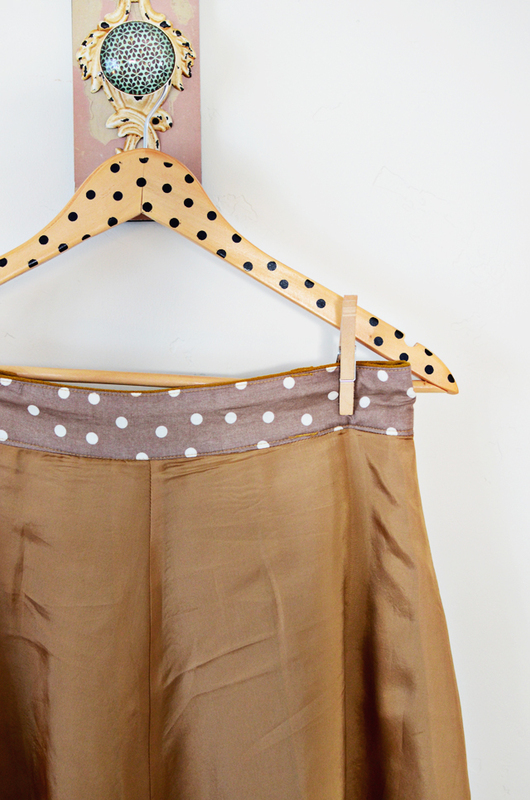 For my wool crepe Hollyburn skirts, I used a contrast piece of cotton as a waistband facing. Note: In this pattern the waistband is one piece that is folded over. I separated the piece and created a facing instead. This technique is something that could easily be used in parts like a collar stand, cuff facings (on a shirt/blouse) or a pants/trouser waistband. Additionally, you could also use petersham ribbon as a waistband or facing. I do this a lot. Now, you might be asking, "Well, why would I want to go to all this trouble when I could just as well use a different fabric instead?" I have to tell you, from my own experience, wool is worth the trouble. It's a lovely, lovely textile. It has fairly unique properties that set it apart from others and it's always worth it, in my opinion, to work with wool. Like other fiber/fabric types, it has its own skill set when you use it, but all of the skills you learn with wool make you a better sewist anyway - and that's totally worth it! 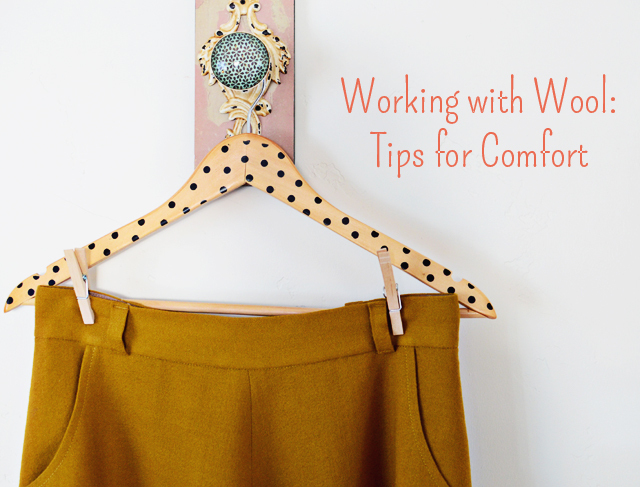 Do you have any tips for comfort when working with wools? Please add them to the comments! I would love to know. For more about Wools, visit the Working with Wool Section! I'm not sure how true this is with wool fabric, but I know with wool and alpaca yarn that one of the benefits of washing and blocking a swatch is finding out how the yarn blooms. A yarn that seems firmly plied and smooth might loosen up a bit with washing, allowing formerly flattened fibers to lift up and become tickly hairs. Or a fuzzy yarn that that seems like it would become irritating to sensitive skin while in the skein might become just a little bit matted when washed, making it less itchy. So I would guess that pre-treating a test swatch of your wool fabric would be beneficial for the same reason: besides alerting you to any shrinkage, it will let you know if your wool will have a slightly different feel. Thanks for the tip about the Easy Guide to Sewing Linings, it's been on my wishlist for a little while and wasn't sure if I should look at something else since it's out of print. But now that I see it's Sunni approved, I will hunt it down (I prefer physical copies for sewing books) as I just love lined garments myself. Thank you for such an informative post! 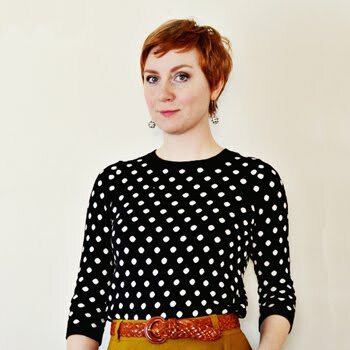 I had looked at your Hollyburn skirt in wool crepe and had that exact thought about the waistband - isn't it itchy? Cutting the pattern piece in half to add that different facing is simple and would make such a difference in the comfort factor. That was a big reason I had held off ordering wool crepe. Sigh... now I might need to wander back over to your website and check out that wool crepe again.... as if I didn't have enough fabric! LOL! i have been following your blog for a couple of years now. I am so grateful you are blogging more. I am really trying to up my sewing skills, but I live in a remote part of Canada and access to teaching is nil. Thank you for all of your insightful information. Your style is very similar to my own and you have such a professional touch. Just wanted to say hello and thank you! Thanks, Sunni, for this post. How timely, I was just about to cut out my wool skirt. Now, I will use this technique for the waist band facing. Love the posts! I live in a populated area of Canada and teachings aren't that easy to find either. Or at least good ones. If you have a fabricland/fabricville accessible to you, classes may be offered (not all of them offer the service unfortunatly). But I've noticed it is often for basics, so if you've been sewing different types of garments for years, you most likely won't learn new things to improve. And from experience the teachers are hit or miss. So I ended up looking elsewhere for more information once my intro to sewing class was done. I myself follow Sunni for extra tips and info, she's so insightful. I also discovered the online classes on Craftsy (which Sunni has mentioned herself) and if the sewing classes are anything like the 2 crocheting classes I bought myself for christmas, than it could be a great source for you to up your skills (provided you have a decent internet connection). They often have sales so it's easy enough to snag up a class at 20$ or even 15$. I really enjoy your blogs and I am also glad you have time to blog more. I am looking forward to taking some of the upcoming classes. Great tips, Sunni. I would even say that these tips are great for any project, in any fabric. I line almost all the garments I make, and it really adds to the comfort and professionalism of each piece. I recently lined a denim skirt with rayon, and it's glorious! I'm a huge fan of linings and am always willing to go through the extra effort to include one. lovely post (as always), i am such a fan of wool (i even have a wool duvet - hypo allergenic fibre and better temp regualtion than down), nice tip on velvet facings, may try it on a wool tunic on my to-do list. I totally agree that wool is a great fabric to work with but for most people it does need to be lined. I have even got to the age where I have to line trousers if they are made of wool, otherwise the itch factor gets too much for me. As regards linings, one short cut that I use nowadays - maybe far too frequently - if I have a lightly used silk blouse and a fairly pliable fabric, I use the blouse to line the jacket, having trimmed the collar and cuffs off first. Saves time and helps to keep space in the wardrobe! I also line the collars of purchased raingear with a matching/contrasting fleece fabric if the manufacturer has not already done that. Makes it a lot more comfortable to wear. Keep up the good work. I really enjoy your posts. This is a great point Caitlyn. I prefer to pre-launder my wools because I like the fluffed up look afterward. I didn't realize this could actually lead to the wool be more itchy. I'm OK with that though! Thanks so much for your input - all of this is incredibly fascinating and I'm so glad to hear what others have to say and educate us about! I completely agree - both about the lined garments and about physical copies of books. At least with sewing books, it's easier for me to just reach for one instead of hunting up my device and seeing where I've downloaded it to. It makes a huge difference. I noticed long ago, aftering making one wool garment with a waistband that itched, I would never wear it unless I did something about that. Easy peasy fix and it makes such a huge difference! Thanks to both of you! It makes such a difference to feel valued for the input I give here! I whole-heartedly second Crimson Needle's Craftsy recommendation. I have taken a variety of classes on there myself and they are great. Such great teachers like Susan Khalje and Kenneth King too. Really wonderful stuff and you can learn in the comfort of your sewing room! I am so excited for you to take some upcoming classes! We are having a lot of fun in the Sewing Room and I'm excited for what this year has ahead! I completely agree. I tend to line about everything I can too. I notice such a difference in the longevity and wearability if I line a garment. It's always worth it in my opinion to line a garment. Thanks so much for your input Carolyn! These are AWESOME tips Stillsewing! Love, LOVE the silk blouse idea. I'm going to have to do just that. Thanks so much! Sunni, you stated that you pre-wash your wool; how do you do it? Gentle cycle? Hand wash? How do you dry? Also, Connie Long's lining book is available on Amazon; however, they are used books. Thank you and your readers for the great tips.